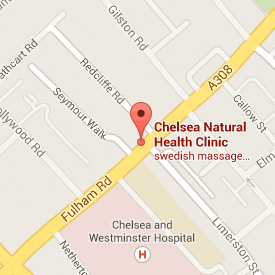 by Jan Murphy MRSS at Chelsea Natural Health Clinic, 208 Fulham Rd., Sw10. According to Shiatsu Therapist and Bodyworker, Jan Murphy, simple steps – including gentle complementary therapies – can be of positive help in treating problems such as impotence, pre-menstrual syndrome and menopausal symptoms. We all know that improving our diet, giving up smoking and taking moderate exercise is good for us. All these can have a substantial impact on common women’s health problems. The trouble is, most of us are too busy, too wound up and too stressed out to stick to good resolutions – even when our doctors tell us that would improve our health. Working from her clinics in Chelsea, Finsbury Park & Tring, Herts, Jan Murphy offers her clients a combination of Shiatsu, Japanese Bodywork, Nutritional advice, self-help and free advice. Shiatsu has been demonstrated to improve endometrial circulation – a factor in infertility – while supplements such as vitamin B6 and magnesium can have a positive effect on PMS. ‘Complementary therapies, such as these have several benefits.